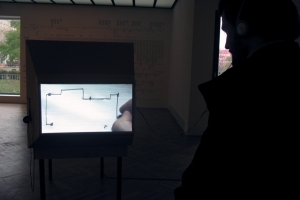 Film “Archive Building” the product of a three month research trip to Warsaw focusing on the contemporary past. 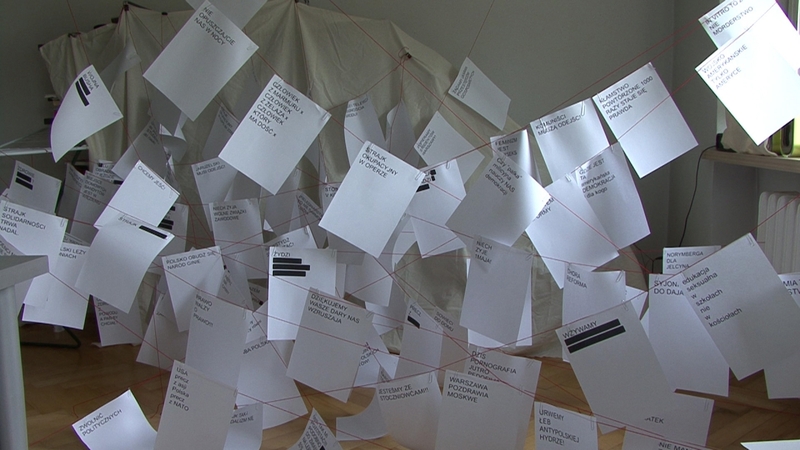 In his research, he explored archives to collect slogans from protest movements and demonstrations from the key year 1968 right up until the present. 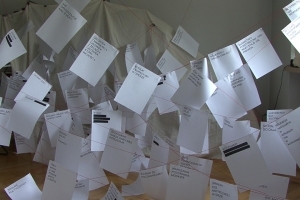 The film records the process of hanging these slogans, each written on a separate piece of card, on a web of red string, like so much encumbering washing, around the space of the flat in which he lived in Warsaw. 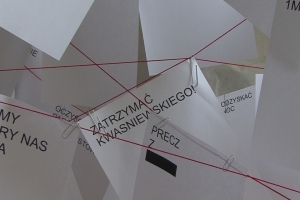 The over 150 slogans that artist collected are from protest movements of very different kinds, often diametrically opposed to one another, that have taken to the streets or influenced the collective debate in Poland during the recent historical past. On occasions, they express the same emotions even if the political positions they come from are implacable enemies. 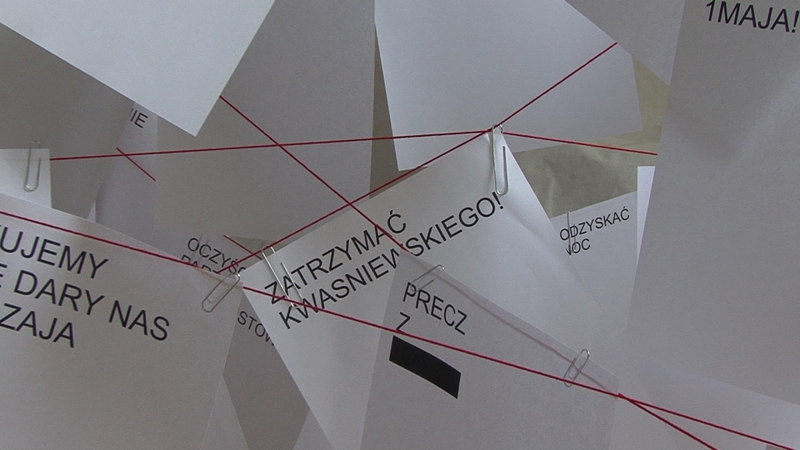 By hanging them in a net, the words become artifacts with spatial form: in what ways do these verbal phrases, these expressions of ideas constitute the particular public space of debate (or even a fatigue with it) with which we are confronted in today’s Poland? The only thing I can recall is a blur of walls, ceilings, floors, doors… Sometimes I can remember a specific corner, a protrusion or nick in a wall; but just for a moment. There are hundreds of these places. Some of them I was even frequently in. I can describe some of them to you if you want. But some of them I can’t recall. They come to mind for just a brief moment; I can’t determine which place it is or when I visited it. I keep trying but to no avail. They’re just fleeting images. What would you like? I often remember what was exhibited here. I always first look at the whole; an exhibition is an assemblage, a cluster of objects that together mean something; even though they very often don’t mean anything; The whole – its effect at first glance is what I know how to capture. I am trying to create a message for the future, a report on the temporary domestication of ideas whose trace is maintained through memories, possibly by a text, but mainly through photographs. 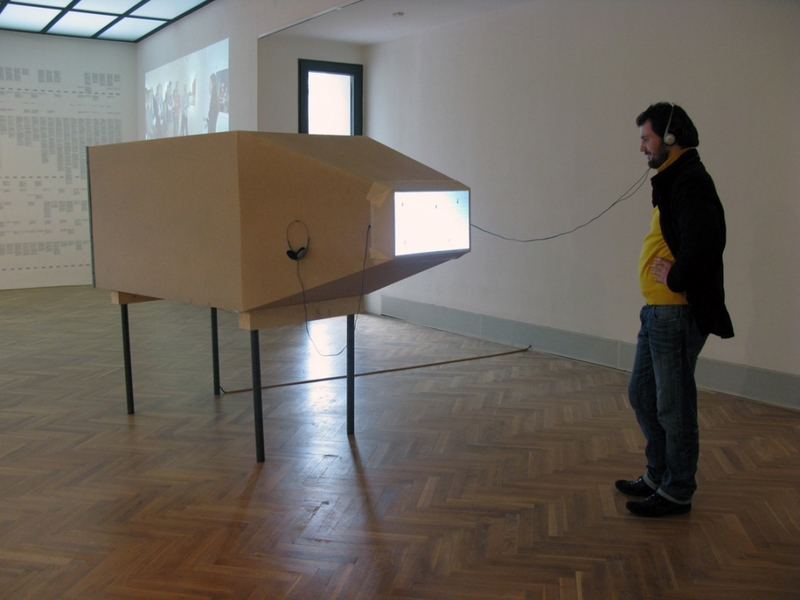 An exhibition is a momentary zone of thought that tries to communicate to us: this is a picture of the world, have a look. 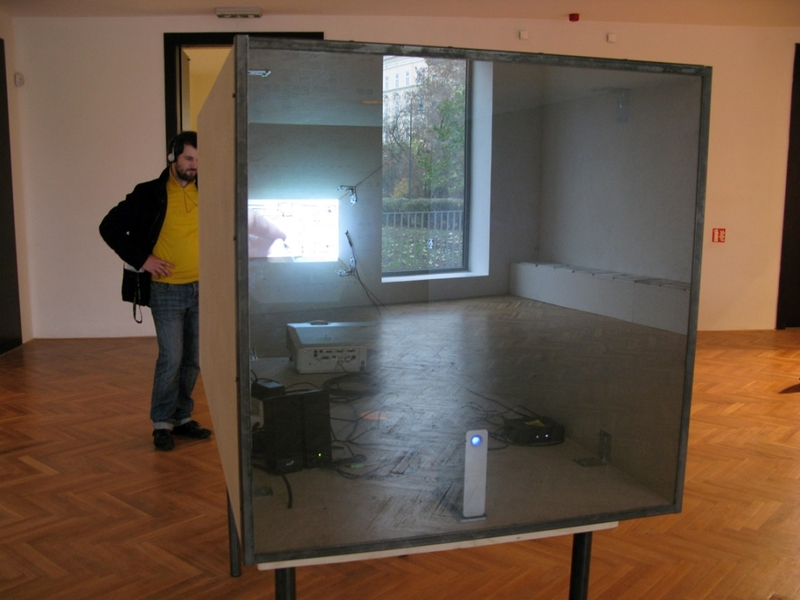 A picture that, however, ceases to be valid when the exhibition ends; it must always be reset, set up differently, again and again. Look at what an exhibition meant fifteen, twenty years ago. The message of the artist, of the curator has vanished; we no longer understand it, or else it doesn’t seem of interest to us – it’s banal or tendentious. What you see is that photographs wrapped up the whole naïveté of the time; all those unconscious things behind the ideas, behind the acts; it’s no longer just a photograph of an exhibition but a picture of a period that was before Google and mobile phones. Yes, it’s in them. And then there’s another message here. My archive as a whole. Most of those people for whom I take photographs have not seen the photographs I’ve taken for someone else. Let alone my entire archive! 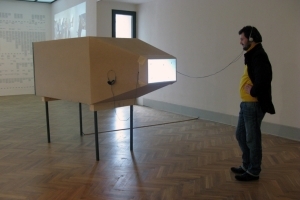 Who will go through it, who will make a meta-message on exhibiting at some time and place in the middle of Europe? 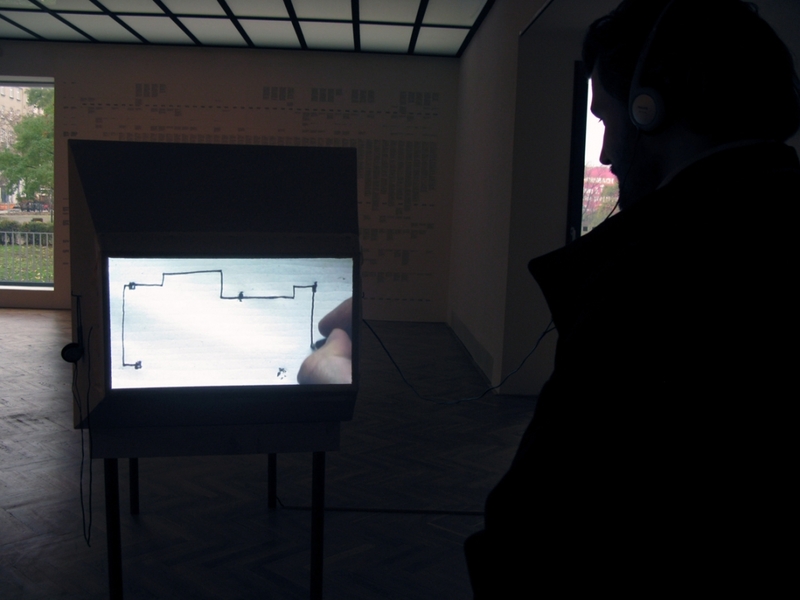 Maybe it’s interesting period material for the future… for someone… maybe as artefacts of extinct civilizations. It’s got over ten thousand photographs. I categorize them by day, month and year. I didn’t expect to remain with it so long; it’s not a collection of photographs that I made from some inner need. It was created and is created incongruously according to who calls me and how much time I have. Which is why this collection is not an objective record of the local art production. On the other hand, it is the largest in the Czech Republic and possibly in Slovakia as well. Before, orientation in the slides and negatives was difficult. Even though I had everything described, it always took me awhile to find something. It was enough to misplace something or not be thorough; and the next time I wouldn’t find it, no matter how hard I tried. Digital technology is amazing in that: only ones and zeros. Eight-bit, sixteen-bit photographs, TIFFs, JPEGs and other formats; all in one technology. Thanks to that I have all photographs on one hard-disk. What’s the use of archives? 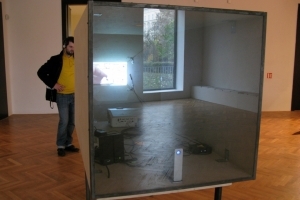 Sometimes when I sit at the computer and my gaze falls from the screen to this grey prism next to it, I can’t believe that part of my life and that of other people is hidden in these several squared centimetres. Sometimes I even think about getting a safety deposit box at a bank and store them there. As you’ve probably already understood, this is a monologue put into the mouth of someone else.